Last November saw Def Mix join forces with SoSure Music to release ‘Boyz!’ from the late Frankie Knuckles, accompanied by remixes from David Morales and Farley & Heller. The release kicked off with the Farley & Heller Dub of ‘Boyz!’ and saw the British duo deliver a low slung slice of house fuelled by chugging organ grooves, raw crunchy rhythms and hooky loops of the original vocal licks. 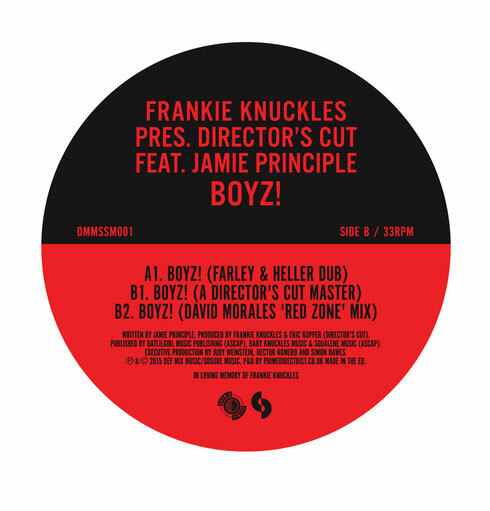 The ‘Director’s Cut Master’ followed and saw Knuckles fuse electro bass hooks with direct 4/4 rhythms alongside an amalgamation of vocal layers from Jamie Principle. Lastly to round off the package, David Morales delivered a take on things under his ‘Red Zone’ guise, offering up a dark and brooding interpretation with menacing synth drones, a swelling sub bass hook and robust drums. ‘Boyz!’ was released via Def Mix Music / SoSure Music exclusively on vinyl on 30 November 2015, but now the mixes are set for a digital release this month. A share of the the profits on this release will be split between The Frankie Knuckles Foundation and The Frankie Knuckles Fund (Elton John Aids Foundation).